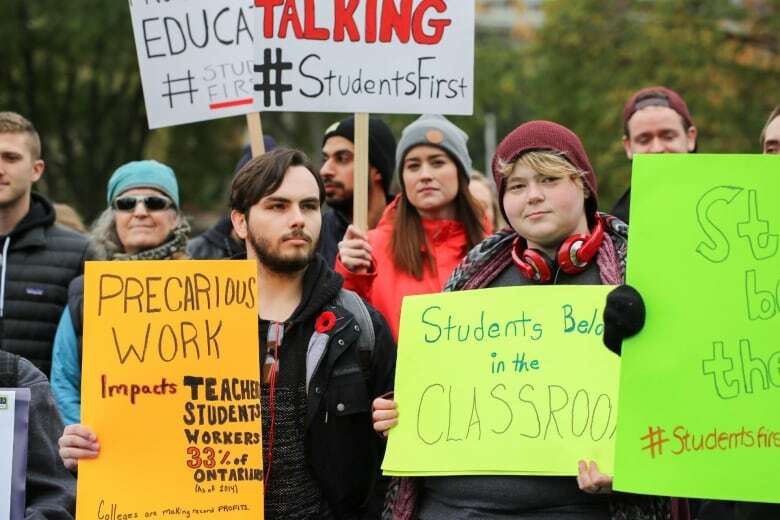 Hundreds of thousands of college students are expected to be back in class this week after the provincial government passed back-to-work legislation Sunday to end a five-week strike by Ontario college faculty. The Liberal government first attempted to introduce the six-page page bill Thursday evening after college faculty overwhelmingly rejected the College Employer Council's latest offer by 86 per cent. But unanimous consent of all parties was needed, and the NDP refused, leading the government to introduce the legislation Friday. All parties agreed to a special weekend sitting to debate the bill. It passed in Queen's Park Sunday afternoon 39-18. NDP leader Andrea Horwath says while she's pleased students will be able to head back to class, she doesn't think this was the best option. "For five weeks, Kathleen Wynne dragged her feet and didn't use the tools available to her and her minister to try to resolve this dispute earlier," she said after the vote. But Advanced Education Minister Deb Matthews says intervening earlier was not an option. "There is a very high bar. Collective bargaining is protected. The Supreme Court has ruled that you have to have a very, very good rationale, that the academic year [must be] in jeopardy. Had we gone before that final offer vote, this absolutely would have been challenged," she told reporters at Queen's Park. Nonetheless, Horwath insists that this legislation won't assist with the underlying issues that led to the strike in the first place. "We still have a broken college system to deal with where 70 per cent of the faculty are not earning decent wages, in other words, 70 per cent are working part-time and contract work, which is not the best for students in terms of their quality of education," she said. Warren "Smokey" Thomas, president of the union representing college faculty, says he agrees but would still call the strike a win, referencing a task force the government has agreed to establish that will look at issues like the college's staffing model and precarious work. "It's a victory in the sense we've got the task force, we've been able to highlight precarious work, equal work for equal pay," he said. In a news statement released Sunday, the government says all outstanding issues are to be negotiated in binding mediation-arbitration. "The College Employer Council and OPSEU have five days to agree on a mediator-arbitrator, or one will be appointed by the Minister of Labour," the statement reads. The colleges and their faculty have been back and forth trying to negotiate a deal for about five months. The 12,000 professors, instructors, counsellors, and librarians have been on the picket line since Oct. 16. Students from across Ontario's 24 colleges have been outspoken during the strike, calling for refunds for time loss. Matthews said that is the plan. "So we have directed the colleges to set aside the net savings from the strike as they have not been paying faculty through the strike, and we will very soon be able to talk about how that money will be dispersed. It will be returned to students and those who are facing the greatest financial needs," she said. The minister didn't say how much funds and what the timeline for a decision of refunds were.